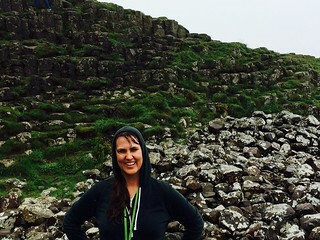 First day in the Emerald Isle and I decided to drive to the Giant’s Causeway. 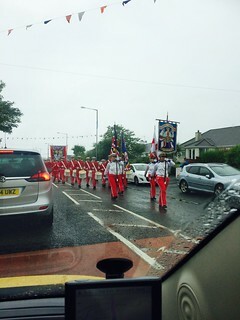 The hour and a half journey became considerably longer though as I had to negotiate all the 12th of July marches that were occurring on the 13th of July. If only the 12th of July marches were on the 12th of July! I had planned to get lunch on the way but as it is a public holiday, everything was shut. I ended up buying the only vegetarian option on the menu at a chip van. You guessed it – chips! I have come totally unprepared for the weather and I don’t have any rain gear. I could get away with that in London but I don’t think I’m going to get away with it here. So after traipsing all over the rocks in the rain, I got back to the visitors centre and decided to buy a ‘mac in a sac’ since the next sight I am going to visit tomorrow is also outdoors. 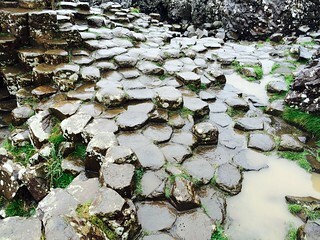 In the end, I spent a couple of hours at the Giant’s Causeway and after considerable reflection, I wrote in the visitors book simply “wet but worth it”. Wet Merilyn on the wet rocks! As I was writing this, I spilt my tea all over my only pair of jeans for the trip. The tea was the other thing today that was “wet but worth it” and now I am too! No I didn’t. I’m not a fan of whiskey or Guinness for that matter but that is just as well since I’ve rented a car for the trip. I would have loved to get some blue sky photos there but not to be. May be tomorrow! 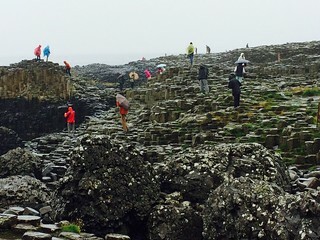 I wouldn’t have thought you would get wet for columnar-jointed basalt, even if it is a world heritage area. Thank you 🙂 So nice to be there in spirit when I can’t be there in person. I know you have high standards when it comes to rocks so if you think they are worth it then they must be good. Your holiday sounds like lots of fun. Were there any promotional images that you could photograph to get your sky blue photo? Oh man! I should have done that again – I had forgotten about that. Oh well!